We recently had the chance to review a variety of snacks from Peter Rabbit Organics. "We make delicious, organic fruit snacks and veggie blends. Our fruit snacks are loved by all ages, and our veggie blends are gulped down by hungry little ones. 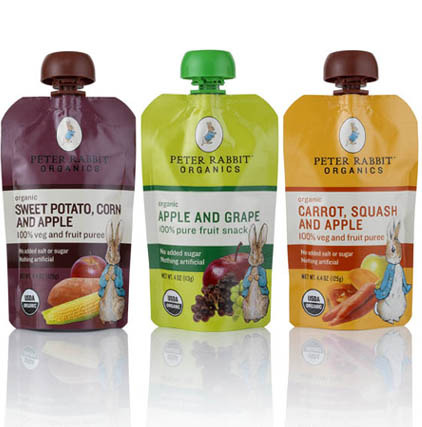 We use the squeezy pouches to make eating healthy food easy and fun...."
What we thought: The kiddos were huge fans of Peter Rabbit Organics, especially 2 year old D. These would also be great for babies and toddlers. They are pretty tasty...I know because I tasted each one before giving it to the kids:) Even the "veggie" pouches were yummy. The combinations really bring out the flavors of each fruit and veggie. The pouches are super convenient and great for on the go. I like the recloseable lid, just in case there is any leftover (which didn't ever happen with our samples:) I like knowing I can give my little ones a variety of yummy and fun snacks while keeping them healthy! ABCD Diaries gives Peter Rabbit Snacks an A+! 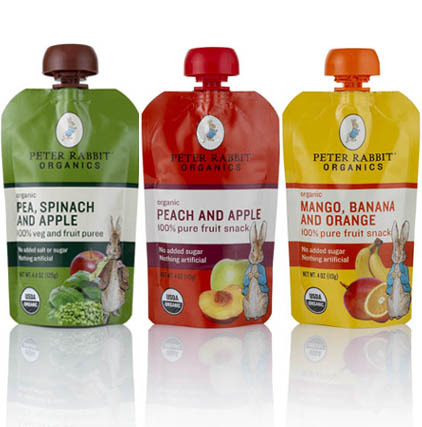 Buy It: You can find Peter Rabbit Organics in Starbucks nationwide, in select Whole Foods Markets, Publix and Albertsons, and natural food stores, in all Buy Buy Baby stores, and online at Amazon.com, Diapers.com, BabiesRUs.com and Spud.com. 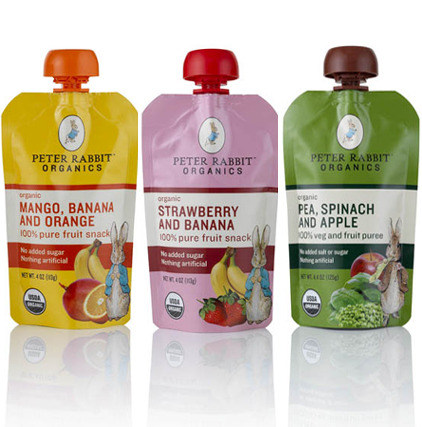 Win It: Peter Rabbit Organics has generously offered one ABCD Diaries reader 12 assorted pouches of Peter Rabbit Organics purees! To enter, follow our blog via GFC and comment below. Giveaway ends Monday, July 26, 2011 at 11:59cst. Winner will be chosen via random.org and emailed. They will have 48 hours to reply. Open to US residents 18+:) No PO Boxes. Disclosure: ABCD Diaries was given Peter Rabbit Organics snacks for review purposes only. We were in no other way compensated. The opinions expressed in this post are ours and ours alone. gfc follower. We love these pouches!! Follow you on GFC as Elena and would love me some organics! I follow as Renee G on GFC and we love Peter Rabbit Organics. entered Large Jar Candle from Bridgewater Candle Company!! entered Disc Golf Challenge Set from HearthSong!! entered Pineapple Habanero Dip from Robert Rothschild Farm! entered Gorton's Free Product Coupons-3 Winners! entered Shredded Coconut from Tropical Traditions! entered Passionately Rivalicious $25 Gift Certificate! 2 Winners! entered $25 Gift Certificate to The Executive Gift Shoppe! entered Ball Discovery Canning Kit! I follow you via GFC - Aimee E.
I entered the scrappynaps giveaway. entered Educational Insights Prize Package! Follow via GFC as Caryn S. Thanks for the great prize!